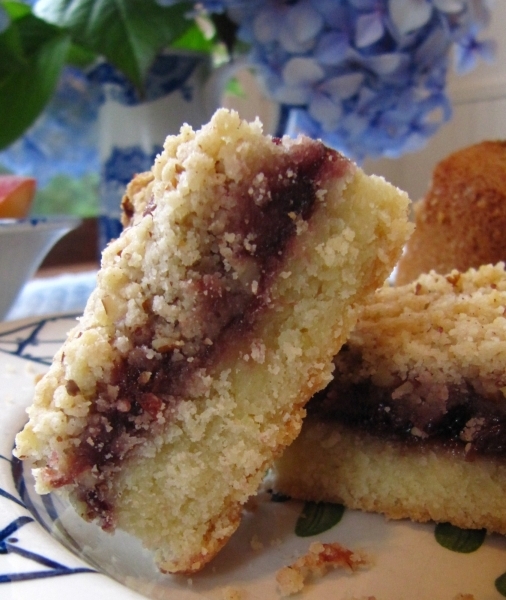 Jumbleberry Jam Bars-A Simple and Thrifty Baked Good! A simple bar made from a jumble of jam! A thrifty family favorite! Note: This blog post and recipe originally appeared on my old website on September 1, 2010. Indeed, this simple concoction has withstood the test of time and remains a family favorite. My daughter is now in college and loves sharing these sweet bars with her college buddies! One boy said he’d buy a whole tray JUST so he could eat them ALL by himself! What do you make with a couple of half empty jars of jam? Jumbleberry Jam Bars, of course! Earlier this week, I was clearing the pantry and the fridge. Many items were being evicted simply because they were past their prime. When I surveyed the “jam department” on the top shelf of my fridge, I realized I had quite a collection of jam at hand– Bonne Maman blueberry preserves, Bonne Maman strawberry preserves, Huckleberry Haven Wild Huckleberry Jam, and Maury Island Boysenberry Jam! I decided that I needed to deal with this motley collection of rather expensive jam. Jumbleberry Jam Bars were the simple sensible solution for my no nonsense housekeeping task. When I make jam bars, I like to use my 8-inch-square Pyrex Storables pan with lid. The pan bakes the bars beautifully. The lid makes it easy to store the bars right in the pan. Preheat the oven to 350 F. Butter an 8-inch-square baking pan. In the bowl of the food processor fitted with the metal blade, pulse together the flour, sugar, and butter until it resembles coarse meal. Add the egg and pulse a couple more times. Pour half the mixture into the baking pan and press the mixture into the pan. Spread the jam over the crumb crust, being careful not to reach all the way to the sides or the jam will burn during baking. Add the cinnamon and the pecans to the other half of the mixture, which is still in the food processor work bowl. Pulse four or five times to chop the pecans. Sprinkle the remaining crumb mixture over the jam. Bake the jumbleberry jam bars in the middle of the oven for about 35 to 40 minutes, or until the crumb topping is brown. Let the jam bars cool completely before cutting into 24 bar. Note: I think ½ cup jam is about right, but some other members of my family think I could increase the jam quantity even further. It’s your choice. Previous Tomato Season 2015-A Whopper!